At Columbia you can experience events such as sitting on the steps of Low Library watching alumnus Barack Obama take office or building a Formula One race car with the Society of Automotive Engineers. You can walk down a hallway in Furnald Hall discussing your new blog or recount last week’s ballet. You can serve as a tutor in a New York City public school, take part in the Varsity Show, an entirely student-run production now in its 119th year, or cheer Columbia’s Lions at Wien Stadium. The annual Varsity Show is an annual musical written by and for students and is one of Columbia’s oldest and finest traditions. The show has one of the largest operating budgets of all university events. Immediately following the College Walk festivities is one of Columbia’s older holiday traditions, the lighting of the Yule Log. The ceremony dates to a period prior to the American Revolutionary War, but lapsed before being revived by University President Nicholas Murray Butler in the early 20th century. A troop of students dressed in Continental Army soldiers carry the eponymous log from the sun-dial to the lounge of John Jay Hall, where it is lit amid the singing of seasonal carols. President Bollinger hosts a 5K Fun Run to kick off each academic year. History Professor Kenneth T. Jackson hosts his annual all-night, 200-person bike ride for students in his History of the City of New York class. Legend has it that the first freshman to find the owl tucked within the folds of the Daniel Chester French sculpture of Alma Mater that sits on the steps of Low Memorial Library will gradate as valedictorian. On the Sunday of finals week each semester, students open their windows at midnight and scream as loudly as possible. The tradition helps students release their pent up stress and anxiety about exams. Orgo Night: On the day before the Organic Chemistry exam—which is often on the first day of finals—at precisely the stroke of midnight, the Columbia University Marching Band occupies Butler Library to distract diligent students from studying in an attempt to raise the curve on the organic chemistry exam. After a forty-five minutes or so of jokes and music, the procession then moves out to the lawn in front of Hartley, Wallach and John Jay residence halls to entertain the residents there. The Band then plays at various other locations around Morningside Heights, including the residential quadrangle of Barnard College, where students of the all-women’s school, in mock-consternation, rain trash – including notes and course packets – and water balloons upon them from their dormitories above. The Band tends to close their Orgo Night performances before Furnald Hall, known among students as the more studious and reportedly “anti-social” residence hall, where the underclassmen in the Band serenade the graduating seniors with an entertaining, though vulgar, mock-hymn to Columbia, composed of quips that poke fun at the various stereotypes about the Columbia student body. The energy on Columbia’s campus is striking. In meeting rooms and auditoriums, theaters and playing fields, brownstones and practice rooms, students pursue their passions. At Columbia, there are over 500 opportunities to explore, to grow, to lead, to share, with support from a variety of offices like Student Engagement, Multicultural Affairs and Residential Programs. Whether you are a varsity athlete or just an avid sports fan, Columbia has a proud history of achievement. An original member of the Ivy League. 31 NCAA Division I teams, 45+ club and 40+ intramural sports. 15 Ivy League Championship teams in the last five years. Several Columbia Olympians and Olympic medalists, past and present. The lion—with its light blue face, dark blue mane, and white teeth—is the universal symbol of Columbia Athletics. It is impossible to attend a sporting event or walk across campus without spotting this ubiquitous icon. The current version of the Columbia lion emblem—which is used to represent the entire University athletic community, including Barnard­—has historical ties that go all the way back to the founding of King’s College. The academic experience at Columbia is both challenging and enriching. No matter where you grew up or what type of education you had prior to coming here, our curriculum will push you to grow as both an intellectual and a human being. But it is not only your professors who will help you become a better thinker. At Columbia your peers also will be some of your greatest teachers during your four years; everyone is both a student and a mentor. You will have an educational experience like no other. College Columbia: One of America’s premier liberal arts colleges set within a leading research university, Columbia College offers the chance to work across disciplines, embrace complexity and become a flexible, fearless, forward-looking global citizen and scholar. Columbia Engineering: Hands-on training for visionary thinkers and enlightened leaders, Columbia Engineering has a reputation for innovative, multidisciplinary, socially conscious research and teaching. Columbia’s diverse community consists of over 8,600 undergraduates, 14,700 graduate students, 4,400 medical school students, and over 3,900 faculty members. The first class of graduates from Columbia was made up of only five students. The State of New York gave Columbia the 14-acre land that became Rockefeller Center in 1929. 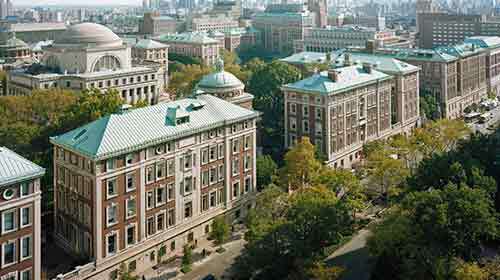 In 1985 Columbia sold the land to the Rockefeller family for $400 Million, which doubled the University’s endowment. Columbia University, originally called King’s College, was the fifth of nine colleges originally chartered in the American colonies. Columbia’s medical college was the second medical school ever established in the colonies. In 1770 it became the first to award the M.D. Dwight D. Eisenhower was Columbia’s 13th president but resigned in 1953 when he was elected president of the United States. (born August 30, 1930) demonstrated keen business abilities at a young age. He formed Buffett Partnership Ltd. in 1956, and by 1965 he had assumed control of Berkshire Hathaway. Overseeing the growth of a conglomerate with holdings in the media, insurance, energy and food and beverage industries, Buffett became one of the world’s richest men and a celebrated philanthropist. (born August 4, 1961) is the 44th and current president of the United States. He was a community organizer, civil-rights lawyer and teacher before pursuing a political career. He was elected to the Illinois State Senate in 1996 and to the U.S. Senate in 2004. He was elected to the U.S. presidency in 2008, and won re-election in 2012 against Republican challenger Mitt Romney.